Rob Halverson (b. 1980, Peru, Illinois) Rob Halverson lives and works in Los Angeles, CA. Halverson’s work engages a range of formats from drawing and prints, to sculpture and curation. Halverson’s practice originated in 2007 with C-o-o-l Art, an itinerant artist run gallery taking shape through exhibitions, events, and editions at various host venues. Through this project, Halverson considered the potential agency to be found within the boundaries of collaboration. Dealing with issues of perception and reflection, Halverson finds impetus for his work in his immediate environment, from the detritus of domestic life and the materials of the studio. As a conceptual framework, Halverson develops open systems of experimentation that address implied or assumed use and value within given sets of materials. The resulting works are visual manifestations of Halverson's interest in these shifting subjectivities. Rob Halverson's drawing flips the relationship between artwork and viewer – here the artwork looks out at us. 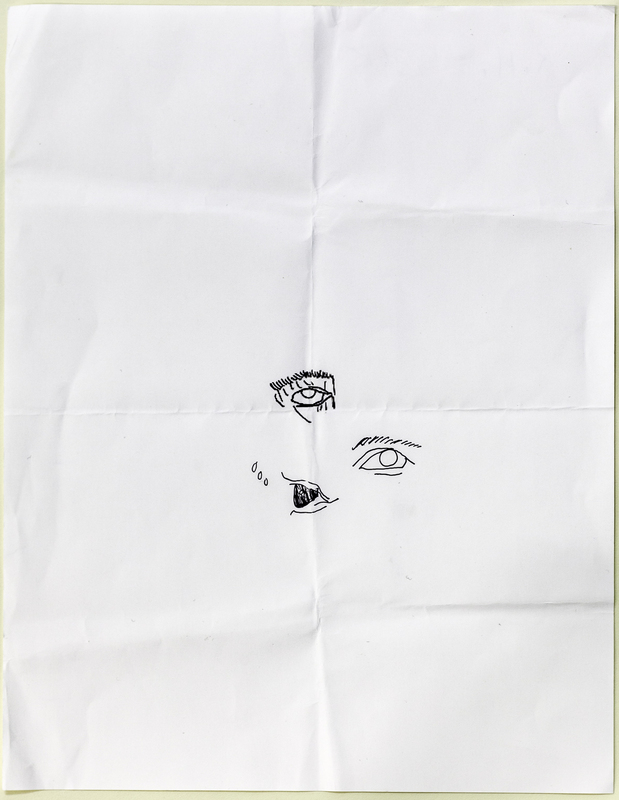 The folded paper suggests a state of flux in which the eye can blink and swivel. This intriguing and thought-provoking drawing relates to “THE LIST GROWS EYEBALL", a text work by Halverson in which he describes in words the pressures on the eye ball.